WEST SYSTEM 105 Resin-based epoxy is a very versatile system. For years, experienced users have been blending the various products in countless ways. For example, users may blend 205 Fast Hardener and 206 Slow Hardener to make a hardener with a modified cure speed. Different uses of 410 Microlight® Filler provide a further example. Many customers assume that the only use of 410 is to make a fairing compound—it is added to thicken epoxy to a peanut butter consistency to create a light, easily-sanded filler. However, 410 Microlight can be used in other ways. Jon Staudacher in Epoxyworks 22 described how he applied a “runny” mixture of epoxy and 410 to fill the weave on a composite part and reduce the amount of fairing required. Epoxyworks 25 described how 410 was added to make a flexible epoxy that would allow hardware to be removed easily and yet would seal out water; this was needed for installing a removable hatch. As these examples illustrate, experienced customers know that by understanding the fundamental characteristics of WEST SYSTEM fillers, hardeners, and additives, they can combine and use them in unique ways for their specific application. G/flex further expands the versatility of WEST SYSTEM 105 Resin-based epoxies. 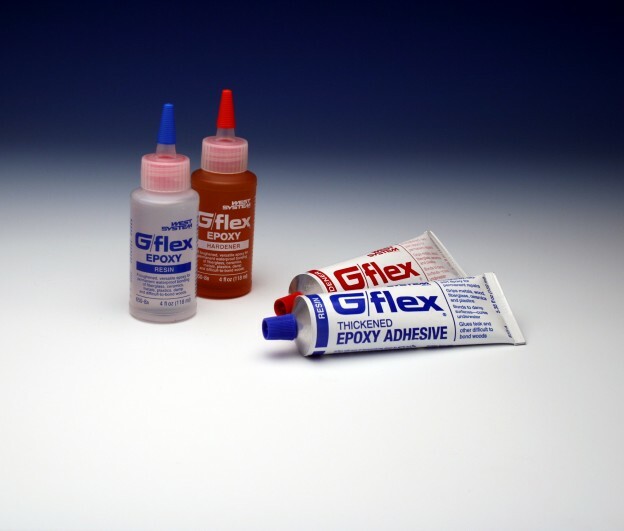 G/flex can be used with 105 Resin and one of its four standard Resin combinations, the resulting cured epoxy will be more flexible and able to deflect more before cracking, but it will also have slightly lower strength. With G/flex, the decrease in strength is not nearly as much as when a low-density filler is used, but the change in flexibility does affect ultimate strength. The table describes how properties will be affected when G/flex is blended with a WEST SYSTEM 105 Resin-based epoxy. We have tested several mixtures of G/flex and 105 Resin-based epoxy in a wide range of physical tests. The blended systems have properties that are proportional to the ratio of each product in the final mixture. Experienced WEST SYSTEM users can follow their intuition to decide what ratio of each system they would like to blend together, much as they do when adding fillers. Remember however, you must follow the correct ratio for each system when mixing any of the WEST SYSTEM resins and hardeners (G/flex is 1:1, 105/205 or 206 is 5:1, 105/207 or 209 is 3:1). If the ratios are correct, it’s not necessary to mix each system separately before mixing the two systems together. The same principle applies to blending G/flex with G/5 Five-Minute Adhesive. In this case you will trade flexibility and strength for cure speed in proportion to the percent of each in the mixture. Flexibility—The flexibility of a material is described by its Modulus of Elasticity. The larger the value, the stiffer the material. It is important to remember that the stiffness is not related to the strength of the material. Stiffness is the physical property that determines how much a component will deflect when loaded. Strength—The amount of stress a material can sustain without failing. Elongation—How much a material stretches when loaded and is often written as a percentage of its original length. The ultimate elongation is the amount it has stretched when it fails. Toughness—How well a material resists fracturing when it is stressed. A tough, strong material resists fracturing and is able to absorb energy. A very strong material may be brittle and unable to absorb energy while an extremely flexible material will not absorb energy because it will deform instead of carrying the applied load. Viscosity—The resistance a liquid has to flow. This property does not affect the cured properties, but is important for application. A lower viscosity material will generally wet out a fabric easily, but will not fill a gap well in a bonding application. See Understanding Flexible Properties for a more complete discussion. For specific questions pertaining to your project, call our Technical Advisors toll free at 866-937-8797 or submit your question through our email Q&A.